Following the recent announce of dates for his first ever ‘spoken word’ tour of Australia, Jimmy Barnes has now added a further nine shows, which will see him ’ tour throughout New Zealand in February 2017. 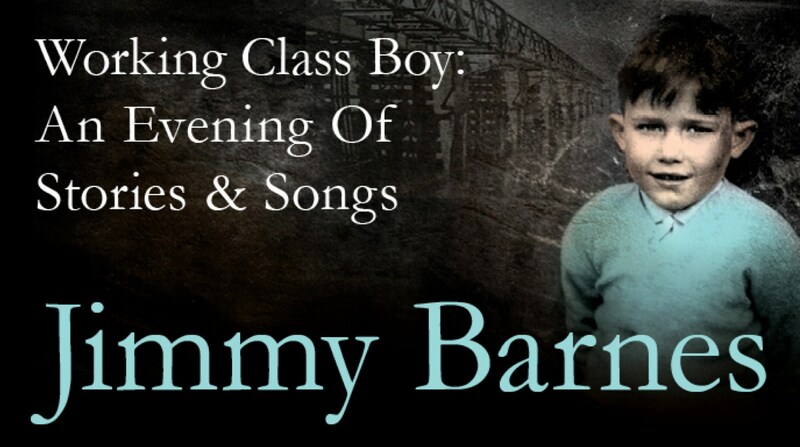 WORKING CLASS BOY: An Evening of Stories and Songs will see Jimmy leaving behind the arenas and rock gigs where he’s blazed a trail for decades. Instead he will now be telling his life story for the first time on nine stages across New Zealand, including special venues like the Civic Theatre in Auckland, Regent Theatre in Dunedin and the St James in Wellington. This unique live theatrical production is a companion piece to the eagerly anticipated first volume of his memoirs – Working Class Boy, released by Harper Collins on Monday 19 September. The book was written entirely by Jimmy Barnes. It tells the raw and confronting story of fleeing the poverty of Scotland only to endure violence and abuse as an immigrant in the suburbs of Adelaide. The book explains what drove Jimmy to ultimately escape everything via rock’n’roll and its associated lifestyle. Fittingly, the childhood memoir ends with an 18 year old Jimmy and the fellow members of his new band, Cold Chisel, fleeing South Australia in the back of a truck full of musical equipment. This special live event will see Jimmy sharing stories from his troubled childhood and delinquent adolescence. It will also see him accompanied by his musical companions, delivering intimate performances, of some key songs drawn from his earliest years. This tour will be a treat with lots of storytelling providing a real insight into the events that shaped Jimmy’s life and his music.